When a long believed dead Indian poet begins to release new works, Robert Luczak, an America reporter on assignment in Calcutta investigates the truth. His journey will lead him deep into the mythic past of India, and bring him face to face the rituals and power possessed by Kali, Goddess of Rebirth and Destruction. The deeper he persists in his investigation, the greater the danger to himself and his wife and newborn child. 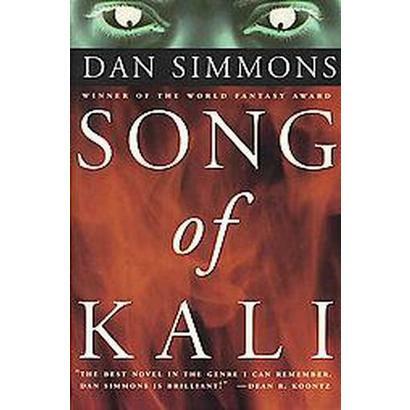 An earlier Dan Simmons novel, The Song of Kali presents a story of the clash between cultures as well as between the ancient and modern worlds. Robert Luczak is an outsider who is gradually exposed to the dark underside of life in Calcutta, and an ancient power he may not be capable of handling. The book moves at an exciting pace and features some disturbing and puzzling scenes. I will admit that those looking for a nuanced view of the place of Kali in Hindu cosmology might find that this book draws too much on the British Victorian stereotype of India as a land of mysterious ancient cults, riddled with Thugee. But Simmons makes an honest attempt to highlight some of the real social problems facing India, especially issues of poverty and overpopulation. For another book by Dan Simmons involving modern culture confronting ancient gods, check out Fires of Eden, which involves the gods of Polynesia, Hawaiian volcanoes, and Mark Twain. Additionally, Robert R. McCammon’s Baal (1978) features modern day characters in over their heads in confrontation with an ancient deity ( a Canaanite storm god). For a more action oriented battle against creatures from Indian mythology on American soil, read The Tomb (2004) by F. Paul Wilson. A conversation with Kevin Hearne, Chuck Wendig, and Fran Wilde.